While most people fear crocodiles, because they are vicious and deadly animals, it is not the case when it comes to this crazy crocodile. This crazy croc is a friendly and a generous animal who wants players to have fun and to earn great rewards. This is why it invites players to enjoy this classic 3-reeled slot machine as they place bets, spin the reels and get to enjoy the great rewards that the game has for them. All what they have to do is specify their wager at the bottom of the reels by choosing the number of coins as well as their value. 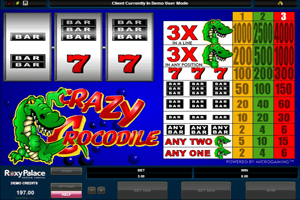 Play Crazy Crocodile Slot here. The icons that appear on the reels include the crazy green crocodile himself, red sevens and the usual low paying bar symbols. Players who get three of these symbols on the payline of the game which is located in the middle of the reels will get to claim a payout. The biggest reward that this game can offer is 4000 coins. This payout is deserved when players have placed 3 coins and have gotten three crocodile symbols on the payline. If they place 1 or 2 coins and get the same combo, they will only get to claim 1000 or 2500 coins, this is why players are always advised to place the biggest bet. The game has no special symbols, wilds or scatters but it makes up for it with the generous line payout.